Alone in Berlin opens on one of the only scenes of action, with a solitary German soldier running through the woods before being shot by enemy soldiers. We soon discover that this young man was the only child of working class couple Otto and Anna Quangel (Brendan Gleeson and Emma Thompson). Overwhelmed by grief they are forced to keep under the surface, the couple begins taking small steps to distance themselves from their involvement with the Nazi party. When even this is not enough to overcome their loss, Otto begins writing anti-Nazi statements on postcards, leaving them around Berlin, with the help and support of his wife. As underwhelming as this action seems, even the smallest sign of dissent is viewed as an unacceptable attack by the Nazi party. Refusing to allow the postcards to continue spreading, pressure is put on Inspector Escherich (Daniel Brühl) of the police to find the culprits and bring them to the Nazi party for punishment. Even as the police begin to close in on Otto and Anna, Alone in Berlin remains surprisingly one-tone. The narrative doesn’t build tension and the ending is so anticlimactic that it will likely leave some audience members wondering what the point of the film was, especially if even the filmmakers seem to lack excitement in the material. Even without a story arc that is exciting or memorable, there are some praise-worthy elements in the filmmaking process. Emma Thompson and Brendan Gleeson aren’t given much to work with, but show their ability to make even underwritten characters come alive. Even their ability to speak the English lines with slight German accents impresses, especially compared to many of the supporting actors, who don’t fare so well. The exception is Brühl, who may have been born in Spain but grew up in Germany. This international actor gives far more depth to his role than it seems to demand, though it only highlights the shortcomings of the screenplay even further that we feel as though there are pieces missing to his story by the end of the film. 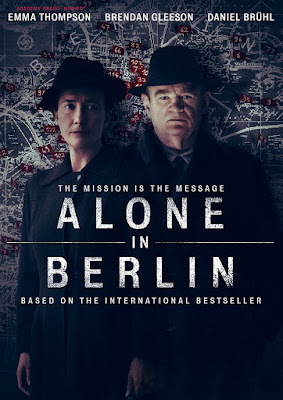 Underwhelming in nearly every regard other than the three leading actors, Alone in Berlin has been given an appropriate release on DVD, for better or worse. The special features include brief interviews with key cast/crew, as well as a theatrical trailer.